On 20 April 2010, the semi-submersible drilling rig Deepwater Horizon owned and operated by Transocean Limited caught fire in the US Gulf of Mexico and subsequently sank. The rig was drilling an exploration well on a BP deepwater lease. BP is committed to doing everything in its power to contain the environmental consequences of the incident. Not even the death of the 11 people is mentioned. Total exploration expense in 2009 of $1,116 million (2008 $882 million and 2007 $756 million) included the write-off of expenses related to unsuccessful drilling activities in the deepwater Gulf of Mexico ($391 million), India ($31 million), Angola ($28 million), Egypt ($27 million), and others ($31 million). Now, how much is actually produced by BP down there in different fields in the Gulf every day? So make your own guess, how much is coming out there free flowing every day! All of BP’s efforts to date have really been “Hail Mary’s” doomed to failure. The only real chance is to relieve the pressure by drilling several adjacent wells, and that will take months. If BP has discovered the mother of all fields with pressures so enormous, they can’t be controlled with modern technology, a possibility which some geologists admit, then more huge leaks will spring and the nuclear option will be the only one left. In the meantime, if a serious hurricane hits the region, a mathematical probability, then we will see the environmental equivalent of Chernobyl meets Katrina. In this scenario, you can kiss BP goodbye. So how big could the field be, how much oil is down there that could potentially come up? The ruptured well may hold as much as 1 billion barrels, the Times reported, citing Rick Mueller, an analyst at Energy Security Analysis in Massachusetts. BP previously estimated the field contained 50 million to 100 million barrels of oil, the U.K. newspaper said. 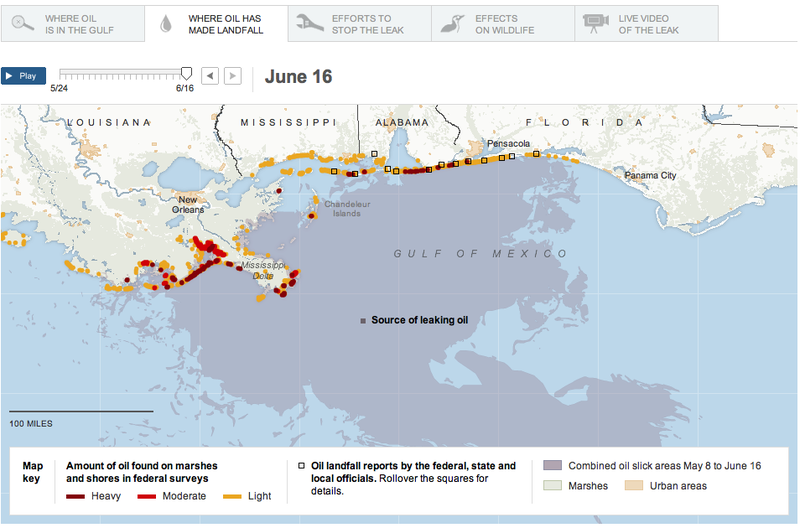 For comparison, Exxon Valdez spilled 0.27 million barrels into the sea. Around a million is estimated to have come already out of the current leak. BTW, BP has total net proved crude oil reserves (not considering natural gas reserves) of 10.5 billion barrels. Indeed, it grows very little each year, very little is consumed each year. Difficult to fake, popular and appreciated not only by woman... What better benchmark do you know? So instead of stating the price of gold in different currencies, it makes much more sense to state everything else in gold units. Some years ago when starting to work at a bank, I was wondering what could be the maximum amount possible to steal from a bank. After a certain threshold, a whole army would come after them, wouldn't they? Of course, unless everything gets stolen, then the thiefs are the one with the army anyway?! And that's how it turned out. The whole western capitalistic system has been subverted. And as every banker has become a bankster, it is even impossible to pinpoint any individuals. Coup d'etat. Let's see what will follow. Europe has just capitulated too. Yes, why rob a bank when you can work for one (Mr. Dougan)?! And BTW, as the final name of this crisis is still out, my pick would be "Accounting Crisis". But then, maybe just a matter of time to attach the word Catastrophe onto it. There are exceptions. A famous 1993 article entitled "Looting: Bankruptcy for Profit," by George Akerlof and Paul Romer, drew exceptionally on the experience of regulators who understood fraud. The criminologist-economist William K. Black of the University of Missouri-Kansas City is our leading systematic analyst of the relationship between financial crime and financial crisis. Black points out that accounting fraud is a sure thing when you can control the institution engaging in it: "the best way to rob a bank is to own one." The experience of the Savings and Loan crisis was of businesses taken over for the explicit purpose of stripping them, of bleeding them dry. This was established in court: there were over one thousand felony convictions in the wake of that debacle. Other useful chronicles of modern financial fraud include James Stewart's Den of Thieves on the Boesky-Milken era and Kurt Eichenwald's Conspiracy of Fools, on the Enron scandal. Yet a large gap between this history and formal analysis remains. The complexity of the mortgage finance sector before the crisis highlights another characteristic marker of fraud. In the system that developed, the original mortgage documents lay buried – where they remain – in the records of the loan originators, many of them since defunct or taken over. Those records, if examined, would reveal the extent of missing documentation, of abusive practices, and of fraud. So far, we have only very limited evidence on this, notably a 2007 Fitch Ratings study of a very small sample of highly-rated RMBS, which found "fraud, abuse or missing documentation in virtually every file." Ask yourselves: is it possible for mortgage originators, ratings agencies, underwriters, insurers and supervising agencies NOT to have known that the system of housing finance had become infested with fraud? Every statistical indicator of fraudulent practice – growth and profitability – suggests otherwise. Every examination of the record so far suggests otherwise. The very language in use: "liars' loans," "ninja loans," "neutron loans," and "toxic waste," tells you that people knew. I have also heard the expression, "IBG,YBG;" the meaning of that bit of code was: "I'll be gone, you'll be gone." But you can argue that if you are not willing to react with equanimity to a market price decline of 50% two or three times a century, you are not fit to be a common shareholder and you deserve the mediocre result you are going to get compared to the people who do have the temperament, who can be more philosophical about these market fluctuations. was $255/oz, down 35% compared to the same period last year. In general, platinum can also be used in diesel catalysts, palladium is so far mostly used in standard gasoline engines. For this purposes, palladium and current levels is much cheaper and therefore preferred by manufacturers, however more palladium is needed per catalyst than when platinum is used. The rhodium market has been relatively calm in comparison to 2008 when a record price in excess of $10,000/oz was recorded in the first half of the year before collapsing to less than $1,000/oz by November. 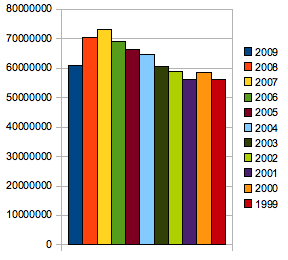 With demand subdued due to falling car production, rhodium is expected to be in surplus in 2009. 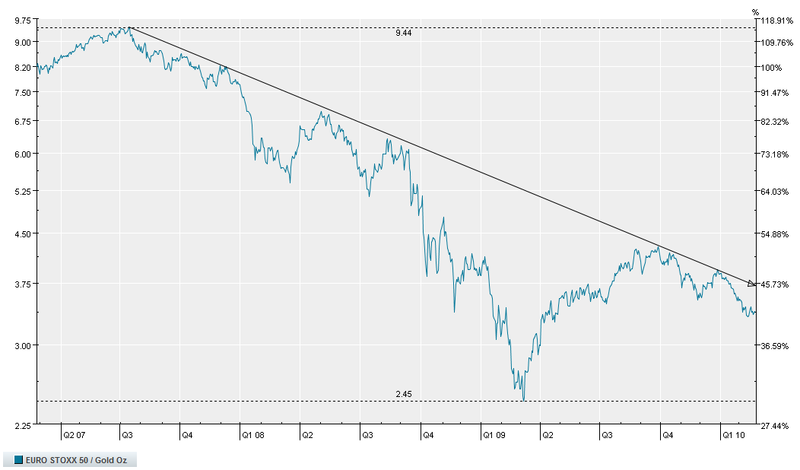 The price is nonetheless trending modestly higher in what is a small and often volatile market. The average price in the first half was $1,509/oz, substantially lower than an average in excess of $8,000/oz recorded in the same period last year. Rhodium is also used in the jewelery business, bought in grams, and then fumed over other white precious metals to make it even more shining! The biggest pharmacy companies ranked by sales - half a trillion USD in total. To put it in perspective, all sales of Wal-Mart are at USD 405 bia. 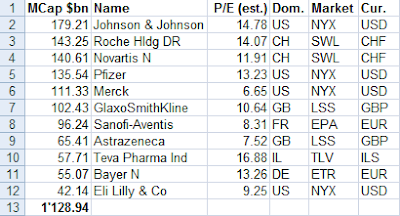 The company price to sales ratio for the big pharma sector is 2.65 (0.5 for Wal-Mart, just to give the number). Pharmacy for USD 1.1 trillion. USD Bia  Company            Dom. Market  Cur. With talk recently about Gold being on an all time high denominated in Euro, let's have a look at the most important European index, the Euro STOXX 50: in Gold troy ounces! 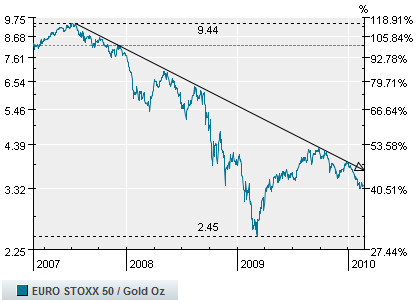 What a wonderful downward trend for the Euro STOXX 50 in Gold. Or could we call it deflation?! And maybe it's inflation for Gold in terms of Euro!? Inflation - Deflation: is it just a matter of perspective?